Predicting the outcome of 2017’s French election will be like playing Russian roulette: you ignore the outcome and it could get messy. It will potentially be one of the closest elections ever seen under the Fifth Republic. Until the second round of the election. What can be sure is that the Front National will be a predominant force in 2017, with polls across the country suggesting that Marine le Pen’s party will play a key role in the election. The party is even predicted to receive the largest share of the national vote in the first round, with up to 30%. This would send the far-right group flying into the second round, where it will hit a brick wall. In what could be a similar scenario to 2002 for the FN - where leader Jean-Marie le Pen received only 18% of the national vote after making it through to the second round, losing against what was an unpopular figure, Jacques Chirac - , French voters will realise the gravity of the situation, and either support the opposing candidate or instead abstain. In fact, such is the anti-FN sentiment among French voters that, were François Hollande - who is not trusted by 74% of the electorate - to miraculously reach the same stage, over 50% would opt for the President. However, Hollande’s chances of even making it through his party’s primaries look rather slim against his Prime Minister Manuel Valls. The PM, who is considered to be on the right of the party, would be backed by a quarter of French voters if the Parti Socialiste’s primary elections were held tomorrow. On the other hand, only 7% would support François Hollande. With this in mind, it would be surprising for Mr. Hollande to even put himself forward for the leadership of his party, if he wants to avoid embarrassment. But in what is looking like an inevitable outcome in the Parti Socialiste’s primaries, things look very different for “Les Républicains”. In this case, the two front runners are Bordeaux Mayor Alain Juppé and the notorious Nicolas Sarkozy. The former French President is an unpopular figure among voters, with over 60% saying they dislike him. These ratings could not be anymore different from those of Juppé, who is, according to polls, France’s most popular politician. The LR’s primary elections will be absolutely crucial, and the result could determine whether or not the party claims victory in 2017. 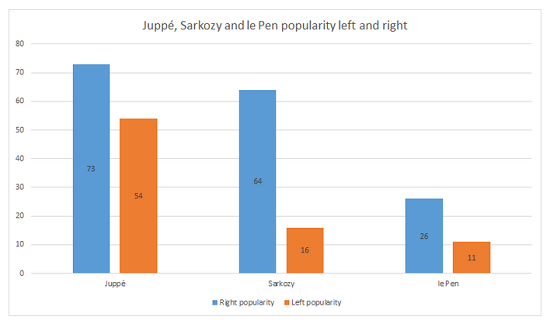 Among party supporters, Juppé and Sarkozy have very similar levels of support, with the Bordeaux man - considered to be on the left of the LR - still ahead by a small percentage of the vote. The FN’s Marine le Pen would receive the largest share of the vote with 29%, propelling her into the second round of the election. 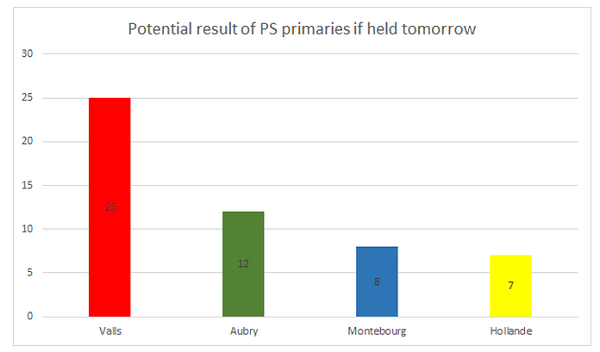 On the other hand, the race for second is far more interesting, with Valls only 1% ahead of Nicolas Sarkozy. Considering that the margin of error for polls is around 3%, this means that either of the two could finish second in the first round. However, the most interesting statistic is that almost 30% of French voters declare that they are either unsure or will not vote as they aren’t satisfied with the choice of candidates. As many voters are still undecided, we could witness a very different result to the one currently predicted. A swing in the vote would probably be in Manuel Valls’s favour. The Prime Minister is one of the country’s most popular leading politicians, and against Sarkozy he will surely win over the bulk of currently undecided voters. This would enable the PS’s candidate to progress to the second round of the election, where almost 60% of voters claim that they will support him against Marine le Pen. But things could look very different if Alain Juppé was elected as the LR’s presidential candidate, as the share of undecided voters would probably fall in his favour. The Bordeaux Mayor is ahead of both Manuel Valls and le Pen in current opinion polls (BVA poll) meaning that he could receive the support of many voters who are still undecided. This close contest between a centre-left politician (Valls) and a centre-right politician (Juppé) will determine who goes through to the second round but also who will subsequently become France’s next President, as both men would beat Marine le Pen in the second round. The battle between Valls and Juppé will be intense, but the LR man could come out on top. What might happen is that - if he beats Sarkozy in the primaries - he will attack the Parti Socialist’s record in government and not the Prime Minister himself, as Valls’s weakest point is his own party. Since 2012, the PS has gone through a turbulent time in government. The party, along with Hollande, was heavily criticised for attempting to implement a 75% tax rate on higher earners - deemed unconstitutional - , failing to increase employment levels and registering slow economic growth. Juppé knows that Valls is popular and charismatic and will use his party’s term in government against him. If that were his tactic he could very well find himself in the “Palais de l’Elysée” as President, but would that send the right message to the rest of the world? Despite the Bordeaux Mayor being almost unanimously loved by voters, he will be 72 soon after the election and will send a “same old, same old” message to other countries and even the French electorate. The excitement and anticipation of having him as President will soon dissipate and return to a sense of normality, as the nation’s leader will be yet another old white man. In fact, since the beginning of the 5th Republic, the average age for an elected candidate in a presidential election is just over 62. Juppé’s election would show that France has struggled to keep up with other Western democracies politically, with the UK electing its first female Prime Minister in 1979 and the U.S. currently governed by its first black President who could potentially be replaced in 2016 by the nation’s first female President. Ahead of the first round of the 2017 election, French voters could be faced with a triple dilemma: a PS politician, a typical candidate and the FN.